Such a beautiful story. I can empathy because my husband was diagnosed at age 52. His mother just passed away with Alzheimer's last week. May peace be with you. Thanks for sharing your story. What a beautiful tribute to your beautiful wife. I am my husband's caregiver (today I'm his sister). We were married 49 years on October 29. He was having a bad day and could not grasp the concept at all. So, today a much better day for him I told him we are going to celebrate our anniversary as today we have been married 49 years. A little like the movie " Ground Hog Day" Now I will continue to do this each day. . Too bad he does not understand gifts are given for special occasions.I would be overwhelmed but then how many diamonds can one woman wear. You have to have a sense of humor to battle through this disease. Paul had Early Stage too. But I'm determined he will enjoy life as much as possible even though he is now in the last stage. Thank heaven for family and support groups. My husband lost his battle to Alzheimer's last January 2015. Late in the game, I started buying my own gifts, and thanking him when it came! He would smile back…as though to say, "you're welcome!" Hang in there, continue to take each day as it presents itself…someday, they will be wonderful memories! Re: Gifts. My Dad has Alzheimer's. For my Mom's birthday I got a card and gift for her and placed them in a gift bag. When I went to see Dad I told him it was Mom's birthday and that he should give her the gift bag. He didn't understand everything but he did it. Inside the gift bag was a card and gift from Dad. So even though Mom knew Dad did not get the items for her, she gave him a kiss and thanked him and he mumbled, "you are welcome". The sentiment in the card and the meaning of the gift reflect what Dad would have said and done if he could. Their love for each other is so very evident. I am incredibly blessed to be their daughter. You did exactly the right time. My daughter took care of the reminding and the giving for a while. I finally told her it was okay for her to let that responsibility go but that I loved her for taking on the continuation of what her dad would have done if he had been able. Then one day she was over and her father looked at me and asked her if I was married. She assured him that I was married and it was to him. He said that he was glad to know it, because if I hadn’t been married, he was going to ask me to marry him…… That is still a heart warming memory for me. The love is still there. The ability to express it is harder but sometimes it does happen. I found, over time – if we could find humor in a situation and laugh together, things went smoother. you have tried to remind your Paul at times as well…..but I am starting to realize we are happier if I just go with it. post I read. Thank heaven for family and support groups as well……. Thank you for sharing your incredible story. My name is Steve Sarns and my company NuStep is a global Partner of the Longest Day – NuStepping to End Alzheimer's Team. Looking forward to raising big dollars June 20, 2016 in recognizing Care Giver's throughout the world. Enjoy each day and Moment Brian- so thankful you have Shannon on your side. Truly heartfelt. Thank you for sharing this, brother. And thank you to all who give care. God bless you! Kudos to Shannon and standing in the diagnosed trenches, I feel your words and pain, Brian. I saw this quote this morning by Ralph Waldo Emerson and think it appropriate. To you, my friend. This is the sweetest most loving Beautiful thing that I have ever read. Like you said you have Alzhemers but it doesn't have you. My only Sister has this terrible Disease,And we can make a difference to stop this. You said some very sweet and kind words about the Love of your life. I am so sorry you have this Terrible Disease, but you will be great because you have that very Very Special Partner. Thank you so much for Sharing your story. It was a bless to read. Good Bless both of you. Everything is relative, and what you need to be doing here is reporting monthly what research is NOT GETTING DONE FOR LACK OF MONEY by NIH and elsewhere and which Senators and congressman are not voting for the funds needed. And why are you not all over VP Biden for not calling for an end to Alzheimer's as it threatens to simply overwhelm our health system. Get the President & VP back on stage and have them add alzheimer to the call for ending cancer. The Lord knows they are drowning in R&D funds for cancer. I truly enjoyed your story and can relate. I am in the same shoes as your beautiful wife. My husband and I have been married 32 years w/ 2 boys and 4 grandchildren. We are truly blessed. This disease has impacted us with his mother and her side of the family. We have done the genetic testing and received the results we expected. My husband just turned 53. I would love for someone to enlighten me about additional life and especially long-term disability insurance. Currently, he is working every day and has only had minor issues regarding his job (that I'm aware of, anyway!). We have plenty of coverage as long as he remains employed. Any suggestions would be greatly appreciated. God bless you and your wife and family!! God Bless you Brian & Shannon. My mother had this horrible disease & my step dad was her caregiver. she was not comfortable around anyone but him. even though she didn't know him most of the time & didn't remember they were married. He took such good care of her until she passed last december. God bless you, Clarence for taking care of my mother for so many years & God bless you Shannon for always being there for Brian. What a woman. Loves her man. No matter what. I am currently a caregiver to a 76 year old woman. I have been following ALZ.org for some years now. I’m doing what I can to keep my mind strong and help others too. I felt the effects of memory loss and confusion from drinking one diet soda a day for 10 years. A friend asked me to quit drinking Aspertain drinks and 3 weeks later I could remember new short term things. I was afraid I had dementia, or developing it. My long time friend whom is an Acupuncturist- Chinese Herbalist called me one day to ask me to watch a video on Oxidative stress on YouTube, now can be found on http://www.abcliveit.com. I learned that Oxidative stress can be reduced by 40% in 30 days with NRF2 activation; NRF2 activation is what allows our cells to produce their own anti oxidants on a 1:1,000,000,000 per second every second. NRF2 activates when our cells are at high level of stress, acting like a thermostat to regulate our survival genes. Any interest in learning more, just reply to the post. I am interested in obtaining more info on the effects of oxidative stress. Also interested in learning how one goes about testing for the genetic mutation involved in the development of Alzheimer's. Did you watch the video on the ABC Primetime Report that aired in 2005 with the link I gave? Because you asked and I'm curious, I called the 24/7 Helpline: 1.800.272.3900, to inquire more about the testing. They can give you some references to diagnostic clinics, but not labs. She'll call back after she checks with a coworker and see if they recommend a particular lab. What a wonderful testament of your love for each other! My Mom has Alzheimer's and it is so hard to watch her slowly drift away from the woman that raised me and my siblings. God gives the strength to be care givers and for that I am grateful for each day. I truely understand, and i love this story. I take care of my mother whom has had full blown Alzheimer’s for awhile now i believe since 2009 and i would not change a thing. My hat is off to Shannon and my prayer are with you may the Lord God bless and keep you daily. My husband also has younger-onset Alzheimer's. He is 63 and started having symptoms about 8 years ago. Just now it is really beginning to take him. He can no longer drive and has a really hard time writing or reading. He was the head manager of purchasing for a major aerospace company. And a avid surfer. It breaks my heart to see him lose all. He still has a friendly personality and is kind to everyone especially children and animals. I almost feel as if he is now a child himself. For me. I've lost my best friend, my lover, my companion. We are unable to have the great conversations that we use to have. I feel so alone. I will take care of him until it is no longer possible but the future looks very black without him. This is such a terrible disease and so hard on the people who love and take care of the ones who have it. Please lets find a cure. So hard to see someone lose abilities they were so good at. My husband had been slowly losing skills to Alz. for years and I was able to care for him by self until he did fall and become hard to handle. He passed on last year after a total of about 10 years of loss. Just be aware that you yourself need an uplift of communication with friends. You will start noticing that people stop calling or visiting with you so do let your friends know you need them to call you or stop in to visit once in awhile. You are doing a very important job for your husband! Take care! Kelly, God is with you always. Sounds like you have wonderful memories of better times, they may be past but not forgotten. Kelly, if you have a Senior Citizens in your area they may be able to help you somehow. Kelly I understand your feeling, losing the husband I love, all I want is to be able to talk to him like we always did. Having only been married 6 years, we were both widowed and gun-shy of marriage, I just feel like my life is unraveling, and I can’t stop it. My husband was just diagnosed 6 months ago, so hopefully overtime we will figure this all out. I’m still working and caring for grandchildren, now watching out for my husband to keep him safe. I’m sure love will help us make it through. My husband of 55 years went to be with Jesus 4 months ago. He had had the disease for 8 plus years….the last 3 years he did not know I was his wife but he cared for me and in the end I was able to care for him at home….One night as I tucked him in he said.." I am glad I married you"….thank you Jesus for that special gift. I was so blessed to be able to care for my husband and to know he no longer has Alz. and that we will be together again one day..
We are early into the progression of this devastating disease. Every day comes with some new (and unwelcome ) challenges. We try to be mindful and appreciative of each precious moment we can have with each other, family, and friends. "Fight the good fight" and may God bless you both. I don’t understand your comment! Please explain. Thank you. What a wonderful expression of love.I was a caregiver for my husband who also was diagnosed with ealry onset Alzheimers,he was diagnosed at the age of 50,and I lost him at the age of 57.It takes alot of strength and love to watch someone you love go thru this.God bless and some day there will be a cure. Upliftng to read your story. It's really hard being a caregiver, if you haven't been there, you just don't know. I also am dealing with the same thing, I have been married 55 years and my husband was diagonosed at 67, he is now 73. I am just as your wife I will be here until the end holding his hand also. He is in the last of the middle stage. I don't know what tomorrow holds, but I knows who holds tomorrow. the ordeal. I was angry and impatient until my children told me how important it was to have time for myself. I spoke to my husband in the present tense, even though he didn't know any of us at the end. There are few diseases that are so devastating . I am now happy to remember him as he was before the diagnosis. We would have been married for 49 years. I still feel him around me, and am comforted knowing he is at peace. I know a little about this as my father, a then practicing DDS who had never missed a day of work in the 23 years I had lived at home, contracted Alzheimer's "way" back in 1986 or thereabouts. I am inspired to read about such a fine woman and a man who can still so eloquently explain all that she had done and is doing for him. It is an inspiring piece and I want you to know how great it is to read about good marriages, especially in this day and age. This was such a sweet story. My father has Alzheimer. He’s in the 4th stage, he has good days and bad days. It hurts so bad to see him go through this and there’s no cure. Not just him, but all our love ones. Let’s raise awareness for Alzheimer, so a cure can soon be found. Such a beautiful letter! Brian, you said it all! God has definitely blessed you with Shannon, and she with you. The love you share and your reactions to Brian's diagnosis make you both hero's. Brian, how thoughtful and observant you are to include other caregivers. Debbie, I wish I had some good advice for you, but I don't. My husband also has Alzheimer's. He can be sweet one moment and angry, cruel the next. He is 83, I am 79. But the only advice I have is to turn to God for help, and live one day at a time. Hi Debbie…… My name is Mary and my husband is 60 yrs. old and was diagnosed with Alzheimer's when he was 56. The hardest thing is finding things for him to do that he would enjoy. He always liked riding his motorcycles and playing volleyball, neither of which he can do any longer. He gets tired of doing things very quickly, (after 5 min. Of walking he has had enough. He doesn't want to ride bikes, play a game, but he Does like listening to music. I would be interested in corresponding to you and sharing ideas or whatever. I find that most of he people that have Alzheimer's are in heir mid to upper 70's and into their 80's, and it's just different when they are so young and have it. Hope to hear back from you. Best wishes to you and your husband. I just lost my husband to Alzheimer's and have been through 14 years of the roller coaster. He was having symptoms at 57 so I know the shock- anger-fear-panic were my first reactions. And denial. They are all part of dealing with this diagnosis and you will both go deeper into strengths you never knew you had. For me the coping skill that helped was 1. Enter his world and find joy together when you can. Arguements won't go anywhere. It was a hard day for me when I realized we couldn't have normal fights about stuff! 2. Take some special care of yourself. Easier said than done! Even to think of ways to take care of yourself and try to do one a week or more!! When my husband was diagnosed with Alzheimer's 3 years ago, I like you, fell apart, anticipating how our lives would change. What I was especially dreading was that at some point, the love of my life would no longer recognize me. So far, our strong personal connection has prevailed and sustained us, and we have many more good days than bad, even with all the mental and physical changes and limitations. People say it all the time, and it is true: Take care of yourself as best you can, so that you can take better care of him, and so that you don't lose yourself in the process. I find that exercise helps me keep my mind clear and my moods pretty even. I also try to avoid people who bring me down with their sympathy. Best of luck to you both. I am a personal friend of Brian's and had the privilege of meeting his hero, Shannon on November 7th at the Walk to End Alzheimer's in Mobile, AL. Brian you are very blessed to have the love, devotion and support that you get from Shannon. Not everyone in your condition has that. Brian, you are loved by many and many that you have never met. This is a horrible disease but I know that the Lord will sustain you and will be with you every step. So will and I and too many to count. I am here for you and Shannon!!! Take care of You and Shannon and God Bless! What a wonderful and inspiring story. I'm going through a very similar situation and this story make me feel that I truly have company. the hospital every day for 3 mos and we got married after I got out. I could never her go so I will continue to care for her for as long as possible. The marriage vows are so true. She so active before played tennis, golf, ran 5 to 7 miles almost every day but now she just sits and stares out the window most all day. Blessings to you Phil! Taking care of an Alzheimer' patient is not an easy task. My mother is now 85 years old. Since she is a wanderer, I had to place her in an Alzheimer's care unit. They are wonderful to her there. Mom calls me her sister, her friend, and sometimes I am her daughter. I have learned to go along with it all. As long as she is positive and is happy to see me, what difference who I am? It takes patience and time to learn to live with this illness. Those people who have large families are fortunate to be able to care for their loved ones at home. Unfortunately, I am alone and after 3 years of slowly seeing her decline, I had to accept the fact that I needed 24 hour care for her and I placed her in an Alzheimer's unit. I visit her and there are times when we have conversation and other times when mom just sits like a child waiting to be told what to do. She cannot grasp a TV program. But will enjoy seeing pictures of nature, as she was an avid animal lover. All we can do is give our love and support. Hi Philip: I'm from VN and have lived in the US since 1954; I taught Vietnamese to Army soldiers & Marine Corps officers in Honolulu in 1965-68. You & I have another thing in common: my husband of 58 years (he is 86) succumbed to dementia since 2014. He retired from 27 years of delivering babies; could not foresee that he got this awful disease!!!. I'm very lucky to have 2 children & their families as well as hired caregivers helping me. Wishing you the best. My name is Eileen Declemente and I loved this story. I was diagnosed with early onset alzheimer's at age 50 and today I am 63. I was someone who loved going to work every day as a family social worker at a nearby school district my husband and I have 2 daughters and 6 grandchildren who I adore. My husband is and has been my caregiver we love each other very much and when I start blaming myself for lack of finances and what my family is going through he looks at me and just says I am here because this is where I belong and u would do the same for me and is right we have been married 41 yrs. The past 5 yrs have been getting to be more of a challenge my health is going downhill fast but we fight it every day. I would like to thank the LeBlancs for sharing their story. My name Edith Pitre and your name caught my eye . My husband mother's name was Declementi .I just thought it might be very surprising if there would be a link. My husband has been fighting this disease for the last 9 years. Caregiving and taking care of one with Alzheimer’s is a major undertaking. I have been a caregiver for my wife who was diagnosed with early onset of this disease. Faith, family and friends have sustained me throughout this ordeal. I try to educate myself as much about Alzheimer’s by attending the brain forum hosted by the Emory University Alzheimer’s Disease Research Center and any training or programs given through the local Alzheimer’s Association. Is an advocate with the local Alzheimer’s Association to push for bill approval in state legislature to bring Alzheimer’s concerns to the forefront. I’m encouraged somewhat that a solution will occur to control Alzheimer’s within the next 10 years or so that will benefit my kids and grandkids. That was a wonderful testimony for your care giver wife, My wife just passed away for alzheimer at the age of 70. We started the journey together and she died in my arms at home. It was a tough 9 years but I would do the same thing all over again. Unconditional love is the story of life. Hi my name is Carol & my 57 yr old husband of 17 years, was diagnosed last year with early onset alzheimer's. He is my best friend, the love of my life. He got the diagnosis one month after he retired from the Dept Of Corrections. I had also retired early so that we could travel & see the world. I started noticing a change in his memory & personal behavior about 3 years prior to the diagnosis. I became very concerned & asked him to see a Dr. to be sure that there wasn't something seriously wrong as he was a professional boxer back 30 yrs ago. He refused telling me he was fine! Things began to get worse so I reached out to his family & kids to see if they had noticed a change. Two of his three children said they did notice him repeating himself a lot & forgetting dates and appts. However his oldest daughter, who is 35 and is also a nurse, blamed his confusion on me saying that I cause him to much stress & that I am his problem. His mother also felt as though I was picking on him regarding my concerns of his health. She planted the seed in his head that I was probably poisoning him. Even after the diagnosis they refused to believe, saying that I filled the doctors in with a bunch of crap. needless to say, my husband, also being in complete denial, began to blame me for poisoning him especially after he had an episode of blacking out, falling to the floor, and said he saw me sitting in a chair & would not help him. I happened to be out shopping when this took place but he insist that I was there and would not help him. 5 months after being diagnosed with alzheimer's my husband, David, filed for divorce with the help of his mother & daughter nudging him on. As of May 11,2015 our divorce was finalized. He now lives on his own in a two bedroom condo. He continues to call me every single day telling me how much he loves me, needs me, and wants me to be with him. His paranoia is really bad as well. I am still deeply in love with this man. I feel really bad that he is going through. This disease is horrible, its is not his fault and he needs me! I just can't abandon him. His mother screams at him when she finds out that he is seeing me. He in return just keeps apologizing to her, like a child, over & over as if he fears her. He now wants to keep it a secret from her every time he sees me so he doesn't have to deal with her. My story, I believe, is a little unusual and I am wondering if there anyone else in a similar situation. I don't know what to do!! Brian, I'm so sorry that this disease struck you and especially at such a young age. Thanks for your words about caregivers. I was a lone caregiver to my beloved husband Edwin for about eight years. I kept him at home until I was advised by the doctor that I could no longer handle him. When he was at the nursing facility, he would not allow anyone to bath or do any of his personal needs so I had to take care of those things while working part time. I loved him more than ever and was so protective of him. We would walk down the hall holding hands and when I took him out for a drive he would reach over and hold my hand or I would hold his .Although he did not know my name, he knew I was someone who cared for him. He passed away last August and I miss him so much. It makes me feel good to tell you and your wonderful wife that you have lots of love to share for a long time. You both will be in my prayers. God works miracles, so trust in Him, He is always faithful and will never leave you or forsake you. He sure was with me during my struggle. I think caregivers everyday I know a couple of wondeful people that are caregivers, One is my step sister she took on the course of taking care of my mother cause they live in Ga. an I live in PA. an no other of her mothers kids would step in an love her the way she needs loved an took care of, My dad does what he can but at 86yrs. old theirs only so much he can do. So I agree caregivers no matter if they do the job for a living are they do it for what ever reason they don't get the credit they deserve. Not sure if I said but my mother has onset Alzheimer's an Dimentia not sure it thats way you spell it. Beautifully written !!! Wow this is beautiful – my Mom is 88 and Dad 90 – he is just like your wife he cares for my Mom who he has been married to for 65 years – talk about dedication, love, support !!! I was truly moved by your article. I currently work one on one with a 59 years old Alzheimer woman, at an all inclusive program. The caregiver is struggling terribly, recently stated, I can not be both a husband, and a caregiver . I feel compelled to help them both, but other than 6hours a aday, Mon- Fri of his own time, I feel something more has to help him,with this horrific undertaking. She has some aggressive behaviors that adds additional stress. We reside in WNC. Thank you. It is true that the caregivers need a lot of strength and patience. I recognized odd behaviors slowly. My mother seemed to always be in denial In the beginning, she was aggressive with me, her only daughter. My father had just passed away. I guess while caring for his kidney failure and dialysis, the focus was not always on mom. When only the two of us were left, I realized mom was pretending everything was okay but would hide things, lock me out of the house, call my neighbors that I stole the car. Initially, I started to take her to day care where we learned of her wandering. Then for 3 years, I took care of mom with help from mature ladies in their late 60's and 70's. They both had children of their own and were very helpful in taking care of mom and keeping her company. After 4 occasions of mom wandering out at night, I finally had to make the decision to place mom in an Alzheimer's facility that is locked so the patient can not get away. It has been a year and a half now that mom is there. Honestly, I think she is in good hands there. Lord knows, it took me years to recover to a semi-normal state. I wonder if the shock ever goes away. Each patient reacts differently. Some are more compliant, I wish I could have done more. Even though I have been told I went above and beyond. It takes time for everyone to accept the situation and learn to work with it so that the patient is safe and the caregiver is sound. Look around your general area for Alzheimer's care facilities. Even if you do not find one nearby, accept that in time, you may be spending less time with the patient. The most important part is to find a good, reputable place that can care for the patient. One, two, or even three people are not enough to take care of someone with advanced Alzheimer's who show aggressive tendencies. It was very hard for me to take that step of handing mom over. But I knew that I was emotionally and physically spent. I understood I needed help and I wanted to know mom would be in a nice place where the caregivers were kind to her and understanding of her situation. Slowly I am getting my life back to normal, except after such an incidence, one wonders what is normal? I wish you good luck and that you find the help that you need. It is out there! They are a blessing to any dementia patient and those who'd like to help caregivers. As a support group supporter, I especially appreciate the advice to, "ask the caregiver what they want," and then, follow through! That's the best advice I've ever heard. What a beautiful story! A true hero. Thank you for your story, it hit's home for me. My mother is the caregiver and it started with my sister, retired USAF Chief Master Sergeant was diagnosed with early onset Alzheimer's in 2010 at the age of 53. The diagnosis stunned everyone, Alzheimer's doesn't run in either side of the family. My Dad's health took a steep decline and within a year he's gone down to nothing. He's lost over 50 lbs, stooped over, walks with a cane, cannot do allot for himself, and the light is no longer in his beautiful blue eyes. My mother has a lot on her shoulder's but is a trooper and does it mostly by herself at a young 81 years old. My brother and his wife, my husband and myself help but it's not nearly enough. My mother is an angel! What a beautiful story and one that needs to be shared. I cared for my husband of 43 years at home until it was no longer safe for him to be with me there.We had wonderful "moments of joy" throughout this horrible disease. He didn't know who I was near the end; however, we could look into each other's eyes and I knew he knew that I loved him always and forever. I was with him holding his hand until he took his last breath and I wouldn't have been anywhere else. He would have been with me if things were reversed. The challenges are many but the rewards are we had a good life with one another that had love and laughter. Humor , prayers and plenty of support saw me through this. If you want to read a great book that helped me and many others at my support group get Contented Dementia. It was the best source for helping and having a quality life that I came across. My thoughts and prayers are with all of you. I became a caregiver and now work in a memory care unit. I feel that this is where I belong doing what I love to do. It has only been nine months since I lost John to an early onset dementia, he was 63. I miss him every day, but know that he is still with me in my heart. Where did you go for THIS particular blood study ? Is it available on any lab in USA? Thank you, Brian, for sharing your story. 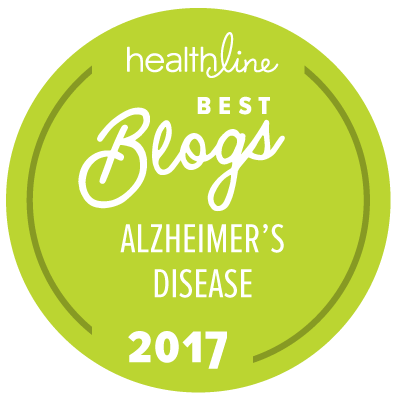 My husband was diagnosed with Alzheimer's 2 years ago, though looking back I know he had it earlier than that. I've always trusted God to be with him and with me through everything (and after 55 years of marriage, that's been quite a bit). He has never failed us. So, when he was diagnosed, I just said to God "One day at a time, Sweet Jesus", just like the hymn. That is what I have done (and continue to do) – just asked Him to help me with whatever I will be faced with that one day, and it is amazing how many hurdles just kinda took care of themselves, like him just turning over his credit cards, and willingly going to have his driver's license revoked. I thought he would pitch a fit!! The thing that amazes me most, is that I have never cried – until today when I read your story, and the other comments. I know I needed that release, and I'm appreciative to all who have written. My husband is said to be on the borderline of the Moderate to Severe stage. He is mostly malleable now, asks daily what we are going to do, and rests easy with me handling things. At first he saw me as his adversary. He said there was nothing wrong with him and he did not need a Mommy. I told him I did not want to be a Mommy, but I did want to always make sure he was cared for properly and with love, and that he did not hurt himself or others or get lost. He fussed over me directing his meds, helping him read a menu and order food, pay for it, trying to get him to quit driving, and on and on. But, slowly, he just seemed to accept it, and now is totally content. He surprises me sometimes with how lucid he is, and I'll think "are they sure about this? But, I understand that is normal, and of course, it does not last. Also, my husband went through personality changes in the beginning. That, to me, has been the hardest part of all this. I could never even begin to guess what he might be like on any day in the beginning. Now his personality, while greatly altered, seems stable, so I sorta know whom I'm dealing with. He is just a shell of the man he was – he could fix any and everything, which I really miss, 'cause guess who can't!! But, it is getting done. I have to say that I've not found it to be as bad as I thought it would be and was told it would be. I just dread, though, the day he needs more than I can give, and I plan to keep him here until the last minute. Brian & Shannon, Congratulations as you are meant to be there for each other a well as the children. Brian I commend you for your true love story. My step-dad Henry has been there for my mother, married 51 yrs. They moved from Phoenix to my youngest bother and his family's home in Colorado Springs, after 2 years Mom was getting worse and falling and my step-dad was wore out because he was still trying to keep up w/Mom. Thus Mom was moved to a home, he visited 3 times per week and just moved into the same home with Mom as he missed her too much and his health is not as good as it was. He has a lung disease and I know he needs to be with her at the end. Mom couldn't have found a better man to marry her and her family of 4 boys and 1 girl…….I'm proud to call Henry my Dad and their son together "my youngest brother" Dad knows how proud I am of him. When reading these beautiful words tonight it has touch me so much. Iam also a caregiver since 2006. My husband was diagnose back in Feb,2007. Since then I have seen himas a strong healthy man to now totally depending on others and myself.It's a terrible illness yet I look at it as a blessing because God me something special. Iwas always strong .Iam not saying that I haven't had my down moments . I have just except everything because at the end of this journey everything will be good . I have shared my love for my husband to all who see me , especially my husband and our thee beautiful children and five grandchildren. Have courage , hold on to what ever gives you strenght. God bless you all. Very touching story and Shannon is a wonderful role model for others. I am a retired neurologist with a special interest in Alzheimer’s Disease (AD), not only because of the many patients I saw over the thirty years that I was in practice, but because my father died of pneumonia, bed ridden from Alzheimer’s, diagnosed seven years earlier. He was buried on his eighty-fifth birthday. His father died in a nursing home of AD at 87. Some in the neurological world are waking up to the realization that obstructive sleep apnea (OSA) is a cause and continuous positive airway pressure (CPAP) is the treatment. You will be hearing more about this as the word gets out, but for now I recommend all AD patients (as well as any patient with a neurodegenerative dementia) have a sleep test and treat faithfully with CPAP when positive for OSA. Studies are already showing promising results. Carol Ramalho. I am in your situation. Alzheimer’s has broken up our family due to the under education of my husband’s family and a couple sleeze lawyers. Life goes on. I was married for 43 years. I know my husband does realize what a terrible mistake he made. This disease is devastating to many families. What a beautiful story! Keep up a good job Shannon.